Are you tired of shaving, waxing, tweezing, and plucking? Now, it’s possible to discover your “beautiful” without the tedious, painful, and often short-lived fixes. Laser hair removal provides a fast, easy solution for permanent hair reduction, allowing you to look and feel your best without all the hassle. Excess body or facial hair can be a problem for both women and men. Frequent hair removal chores including shaving, depilatories, plucking, and waxing are time-consuming, often painful, and always inconvenient. At best, they offer only temporary results, for some only a few hours. Laser technology has brought us a better way, a safe, long-lasting way to remove unwanted hair from any part of the body, leaving skin feeling smooth and healthy. 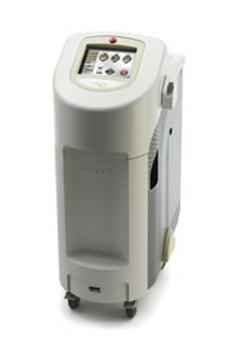 Laser hair removal has become very effective in the past ten years. Often the preferred method of hair removal now, it’s safe, effective, and more permanent than any other method such as waxing, plucking, shaving, and electrolysis. Also, prices are pretty reasonable in most communities. The easiest person to treat for laser hair removal has darker hair on lighter skin. But there are now lasers that do a good job with dark hair on dark skin. It still does not work well for grey hair, fine blond hair, or women with hormonal problems such as polycystic ovaries disease. Also, if you just have a few, coarse hairs on your chin, a good electrolysist will be more cost effective. A laser hair removal procedure can be a short as a few minutes or take an hour or more, depending on the size of the area being treated and density of hair growth. It is entirely safe and generally painless, with the laser selectively targeting the hair follicle without damage to the skin. Because laser treatment destroys only the hair follicle during its growth cycle, having no effect on the follicles that are dormant at the time of treatment, multiple sessions are required to achieve total hair removal in an area. Most require four to eight treatments, six to twelve weeks apart. The secret to laser hair removal is the clinically-proven technology that targets and destroys cells responsible for hair growth without harming surrounding skin. It’s a simple approach to permanent hair reduction that’s fast, easy. Light-based hair removal can work for almost everyone, including all skin colors and most hair types. 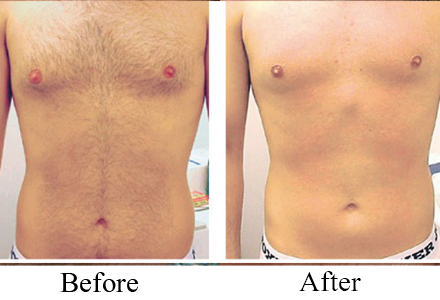 For men, laser hair removal is great for permanently reducing chest and back hair for a cleaner, younger look. For women, it’s a great alternative to creams and waxing for reducing hair on the face and body, including delicate areas around the lips and the bikini line. Laser hair removal can remove hair from the face (except around the eyes), back, chest, arms, underarms, bikini line, and legs. Laser hair removal is available for all skin types, including very light and very dark skin, and most hair colors. Your provider will determine whether you are a good candidate for the procedure based on a variety of factors. Light is used to target and destroy hair follicles responsible for hair growth without harming surrounding tissue. Laser hair removal treatments take just minutes for small areas and about a half hour for larger areas. Several laser hair removal treatments are recommended for the best results. Your treatment provider can help tailor a plan just for you. You do not need to let hair grow out between treatment sessions. Laser hair removal is more affordable than you might think. Ask your Laser Tech representative or local provider to find out what laser hair removal costs in your area. Some typical side effects of laser hair removal include a mild sunburn-like sensation (redness), accompanied by some minor swelling immediately following the treatment. These effects may last a few days. Your treatment provider can provide individualized information on potential side effects with you. The high-powered Apogee+ Aesthetic Workstation provides faster hair removal and epidermal lesion removal on a wide range of skin types, allowing practitioners to treat patients even faster. The Apogee+ boasts higher power and speed, providing practitioners with up to 20 J/cm2 at an 18 mm spot size and 2 Hz. The clinical proven 755 nm Alexandrite laser’s high melanin absorption characteristics and proven long-term results make it a wavelength for excellent hair reduction, permanently reducing hair by an average of 79% after just three treatments.1 The 755 nm Alexandrite can also provide excellent clearance of epidermal pigment lesions, including age spots, sunspots, and freckles. The Apogee + is built on the proven technology of the Apogee Aesthetic Workstation but provides high fluence with large spot sizes for deeper penetration, faster procedures, and optimal results. Apogee’s variable spot sizes and pulse widths allow for complete customization of procedures based on client hair and skin type—for optimal outcome efficiency. Its revolutionary technology sequentially combines gold standard wavelengths and adds Intensed Pulsed Light capabilities, addressing unwanted hair removal, the treatment of pigmented lesions, redness, wrinkles, facial and leg veins, and photodamage. 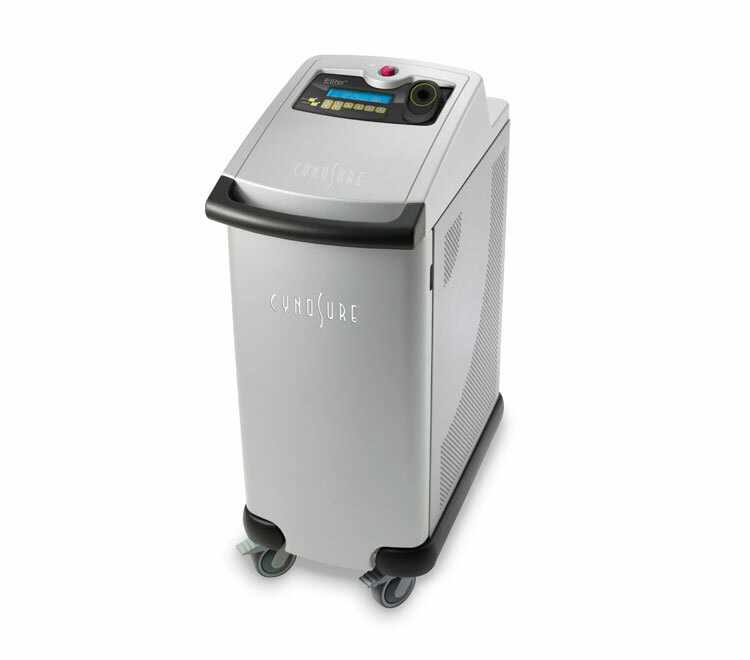 Elite MPX gives you the advantages of two gold standard wavelengths – the 755 nm Alexandrite laser and 1064 nm Nd:YAG laser – in one system. These wavelengths have proven long-term results for pigmented lesion removal and hair reduction, and are also perfect for treating facial and leg veins, the most common form of vascular lesions. Cynosure’s exclusive MultiPlex technology makes it easier to treat these patients. MultiPlex sequentially delivers Alex and YAG to provide customized treatments for ‘The Middle’, providing treatments that are faster and more effective than single-wavelength treatments.Multiplex also provides great treatment flexibility for lighter and darker skin types as well. Multiplex means greater customization for each patient—and greater control for you.